So, I will start with the things you see above, as they were the things I got in the shop called 'Facial Attraction' - a bargain beauty store. I got this neon pink Sinful Colors polish. Megan has this, and I have been wanting it for AGES. It really is neon, as it has a blue/purple undertone and shimmer to it, which gives it even more of a neon sheen. This was only £1.99 and it's called Daredevil. It is opaque in 2 coats (yep, I already have it on! ), and it dries really quickly - great for the small price tag! The next thing I got was £2.99, another bargain. 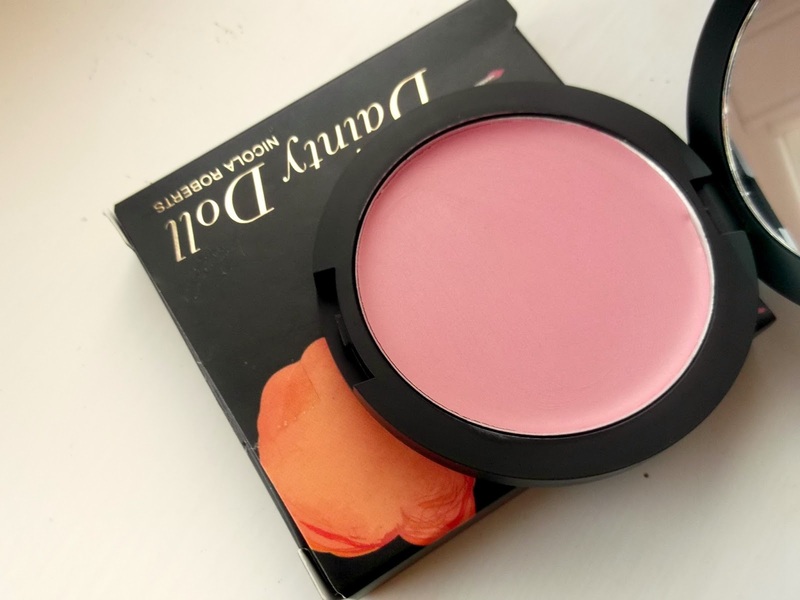 It is the Dainty Doll Cream Blush in Paper Roses, a simplistic pale pink blush. My collection of Dainty Doll products is increasing, but I still think I should have got some more items yesterday! Ah wells, there is always Fragrance Direct. The last 2 things from that store were a whopping £1.99 each - BARGAIN! 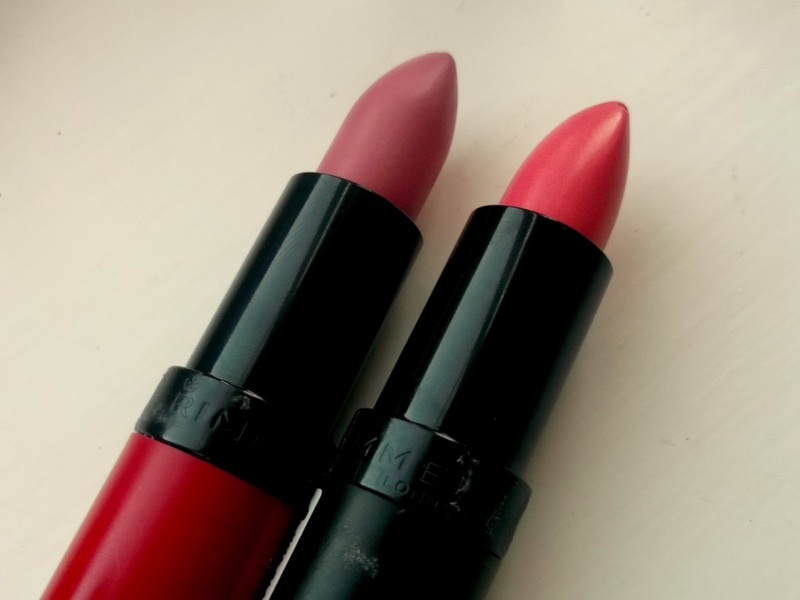 They are the Rimmel Kate lipsticks. I got one of the matte ones, in shade 101 which is a pale purplish pink matte colour, and then I got 16 in the non-matte formula, which is a pinkish coral colour, which is so nice! Moving on to the other shops, this was yet another pound shop bargain. This is a Revlon Colorstay nail polish is Provence, which is a grey-lilac colour, it is really nice and I cannot wait to try it. 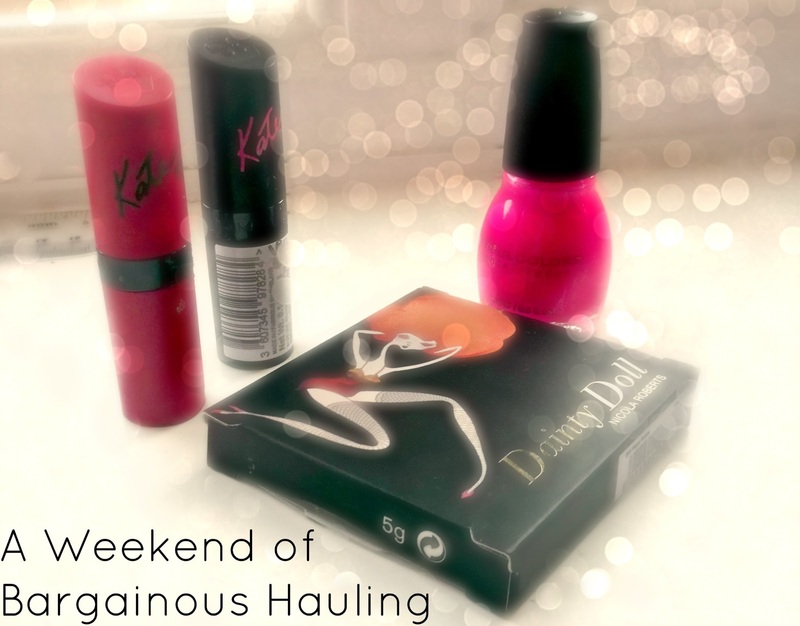 For £1, I couldn't leave it, and MissGlamorazzi loves these polishes, so another reason to buy! So, as you may have seen on Megan's blog, Dorothy Perkins had an amazing jewellery sale, and I had to get these cute pack of earrings! I have been really into wearing earrings everyday at the moment, and I was in the mood for some new ones. 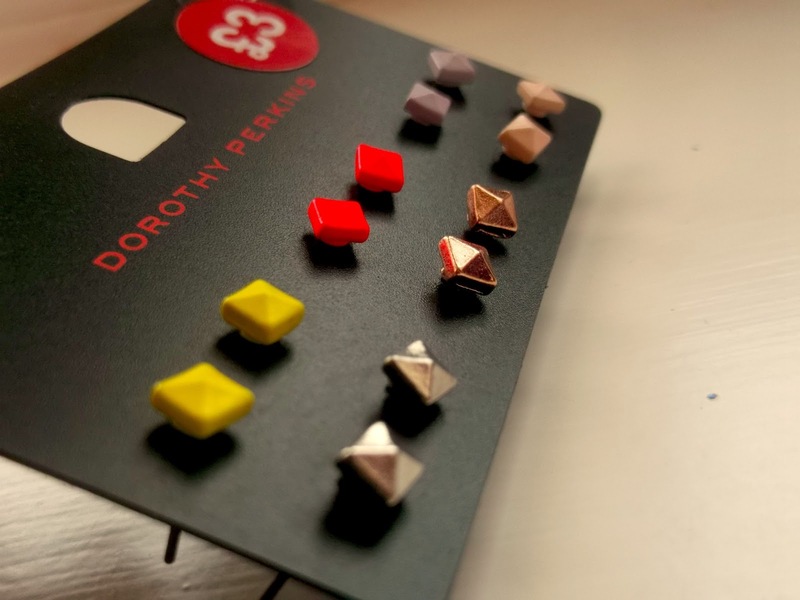 These are just little 'embossed' square studs, there are 2 neon, 2 pastel and 2 metallic colours, and once I had seen Megan with them, I had to go out the following week to get them! I then got the B. 'Pure Micellar Water' as a makeup remover/Bioderma substitute. I'm pretty sure that I will be the last person to buy a bottle of Bioderma.. This was on offer for £3.32 and the woman at the till was telling my how amazing it is, so I just went for it and bought it! Good ol' Superdrug.. 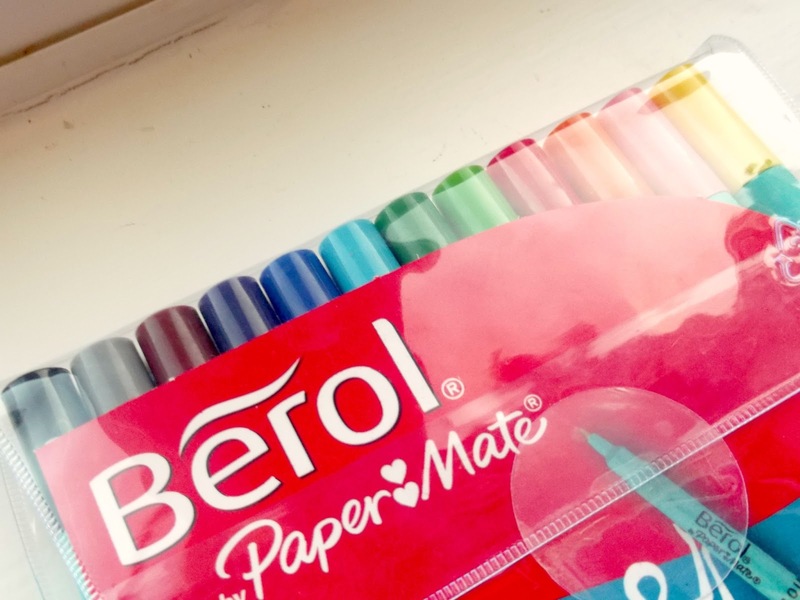 The random purchase of the week was these pens I got off of Amazon for £4.48 including P+P. I got these for revision and planning for my CA's at school, as that's the way I like to learn! I was going to buy a pencil case, but I couldn't find one, so I just will use one I have at the moment. That was all my hauling this weekend, its a little big, but everything was on some sort of offer r discounted price! Thanks for reading, and don't forget to follow on Bloglovin' as today is the day that you will need to get hold of all your favourite blogs and follow! My large advertiser this month is www.thebestmakeupproducts.com . If you are interested in advertising on this blog, visit the Advertisers and Sponsor pages on my blog. Thanks, they are some of my favourite purchases too, such a bargain! Is the B. Pure water good? I want to try out a Bioderma dupe! I have used it every day since I get it, and I am really liking it. It isn't amazing at eye makeup, but it removes my face and lip products really well. I will be doing a full review at some point, so keep your eyes peeled for that! 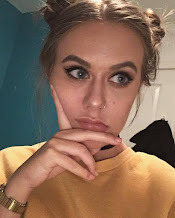 would you like to follow each other on both gfc and bloglovin..? I know me too! I really love the neon yellow ones. I have worn a pair every day I think, they are so nice! And I love the polish too, I have it on now haha!